Perhaps the finest creek side trail in all of Great Smoky Mountains National Park, Middle Prong Trail actually follows Lynn Camp Prong. Lynn Camp and Thunderhead Prong join to form Middle Prong just below the trailhead. You will walk alongside Lynn Camp Prong for the entire length of this hike, passing dozens of swift cascades and two exciting waterfalls. Look for a wide variety of wildflowers in spring and a splendid leaf peeping show in autumn. I visited Tremont on Wednesday, May 10, 2017 beginning at 7:30AM and ending about 10:00AM. My plan was to take the Middle Prong Trail to the junction with Panther Creek Trail, then return. I also wanted to explore part of nearby West Prong Trail. Hike Rating: Easy. Climbing all the way out, but a gentle grade. Trail Condition: Very good. Former logging roadbed. Mostly without hazards. Starting Point: Parking circle at the termination of Upper Tremont Road. Trail Traffic: I saw two other hikers on my way up the trail, and another dozen as I made my way back to the beginning. How to Get There: Head west from the Townsend Y towards Cades Cove. In 0.2 mile turn left onto Tremont Road. It is 2.3 miles of paved road to the Great Smoky Mountains Institute at Tremont, then another 3.1 miles on gravel road to the trailhead. There is enough parking for about 25 vehicles. My day began waking at the Cades Cove campground just before dawn. After a quick breakfast, I made the short drive to Tremont Road, past the Great Smoky Mountains Institute and on to Middle Prong trailhead. Still, I was not the first arrival. There were already two other cars there. Perhaps they were backcountry camping farther up the drainage. Before you even reach the trailhead, you cross a sturdy iron bridge over the confluence of Lynn Camp and Thunderhead Prongs. The sights and sounds fill the senses with loud rushing whitewater. Once across the bridge the trailhead offers two choices. Off to the right is a short, three-quarter-mile nature trail that follows Thunderhead Prong. I went that way to start, then returned. Good advice, and so true. There are many points of interest along Middle Prong Trail that you can hike to, but the destination is simply being there. With each new step, around every bend, there is something new to enjoy and savor. The trail hugs the prong so there is always another cascade, or pool, or boulder to grab your attention. Even the other side of the trail is moist healthy soil that is home to a wide variety of plant life including wildflowers. This area was the very last that was logged even after the Smokies became a national park. Because of contracts the loggers were allowed to continue for five more years after the founding of the park. It has no effect today, however, nearly 80 years later. The forest has recovered remarkably. Just the week prior there had been a major wind storm that hit the Tennessee side of the Smokies causing considerable damage, even closing the park for a couple of days because of downed trees on the roadways and hiking trails. I saw vestiges lying nearby as I proceeded up the prong. It is obvious the Park Service has done remarkable work to clear so much debris in such a short period of time. They are to be really commended for their dedication to providing the best experience for park visitors. Middle Prong Trail is a multi-track, graded former railroad bed with Lynn Camp Prong on the left and sometimes steep rock faces on the right. At times the trail will rise above the river, but it usually stays close by. Trees, ferns and rhododendrons are anchored in large cracks along the rocky face on the right as well as a wide assortment of spring ephemeral wildflowers. At the 0.4 mile mark, the trail makes a sweeping left turn as it surrounds Lower Lynn Camp Falls, a large slide, or chute, waterfall. There is a well positioned log bench here for taking a load off or taking pictures. If you are adventuresome, there is also a manway that plunges to the base of the falls for a closer view. As you round the left turn, you get a nice side view of the waterfall, as well as an outcrop that allows for peering over the precipice. Above the falls the trail levels out for awhile, as does Lynn Camp Prong. Look for the occasional calm, deep pooling here with plenty of large boulders so you can sit a spell. Three quarters of a mile up offers another log bench at the site of a three tiered waterfall that used to be a splash dam used by the logging companies. This is known as Lynn Camp Prong Falls. Once again the trail levels out after the splash dam. Look for dense rhododendron thickets lining the prong that come alive with white flowers in late June-early July. By now the sun was beginning to rise above the nearby mountain ridges enlightening the forest canopy and creating interesting lighting for the rest of the climb up the drainage. At the 2 mile mark look for a side trail on the right that goes about 50 yards to an old automobile artifact. As the sun rises above the mountain ridges it turns the forest canopy a bright, bright green. You will cross a modest earthen foot bridge over one of the branches that flows into Lynn Camp Prong, then ascend a long straightaway to the junction with Panther Creek Trail. This was my turning around point for this day, but if you wish to proceed there are a number of options available to you. Panther Creek is a connector to Jakes Creek in the Elkmont area. Continuing up Middle Prong Trail will take you to Indian Flats Falls and the Greenbrier Ridge Trail, or to Lynn Camp Prong Trail and backcountry camping opportunities. You can even eventually top out at Derrick Knob on the Appalachian Trail. As I turned around and began the descent, the day was warming nicely and I was down to short sleeves. I encountered other hikers who had been behind me earlier and stopped to chat with a few. At times you will have to almost yell because of the loudness of the whitewater. I also wanted to visit West Prong Trail to get a sense of what to expect on a longer hike there. 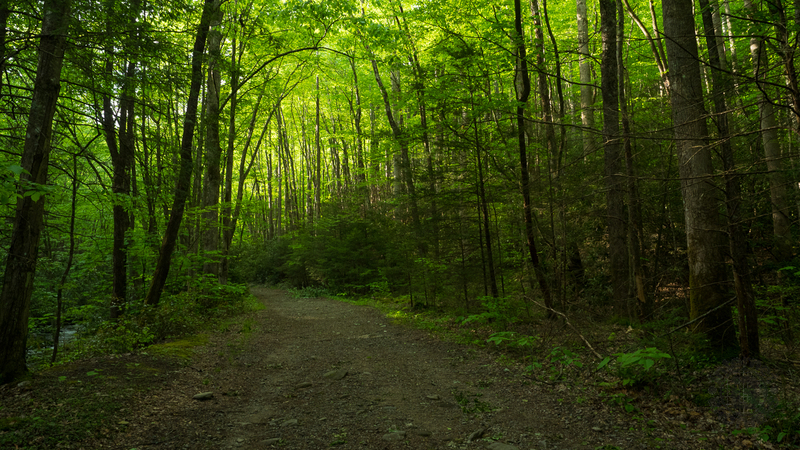 West Prong Trail is a connector between the Tremont area of the park and trails within Cades Cove. It climbs up and over Fodderstack Mountain to meet the Bote Mountain Trail. When I arrived at the trailhead, I could immediately see that West Prong was one of the last to receive cleanup work following the recent wind storm. There was quite a bit of debris still blocking the pathway. So I made a quick visit to the family cemetery that is found high on a hill off to the right of the main trail, then called it a day. Summarizing, the Smokies are famous for a number of exciting features including, majestic mountain vistas, stunning hardwood and evergreen forests, colorful display of seasonal wildflowers, teeming wildlife, and water, water everywhere. If you’re looking for a water hike through dense forest then Middle Prong is exactly the right trail for you. Because of the easy nature of the trail it is ideal for the whole family, so bring the toddlers and the grandparents. Just be careful near waterfalls.